1. Cook the broad beans in boiling water for 3 minutes, drain and cool. Halve the chicken thighs. Heat half the oil in a small frying pan and gently fry the chicken pieces for 10-12 minutes, turning once, until cooked through with no pink meat. Lift out onto a board. Tear the bread into pieces and add to the frying pan. Cook for 2-3 minutes until the bread is lightly toasted. Thinly slice the chicken. 2. 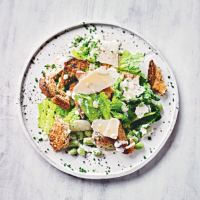 Combine the lettuce, Parmigiano Reggiano, croutons, chicken and beans in a bowl and season. Scatter with the chives and drizzle with the Caesar dressing to serve. Cook’s tip For a leaner Caesar, use a large chicken breast fillet instead. Slice the chicken horizontally before frying to speed up cooking time.